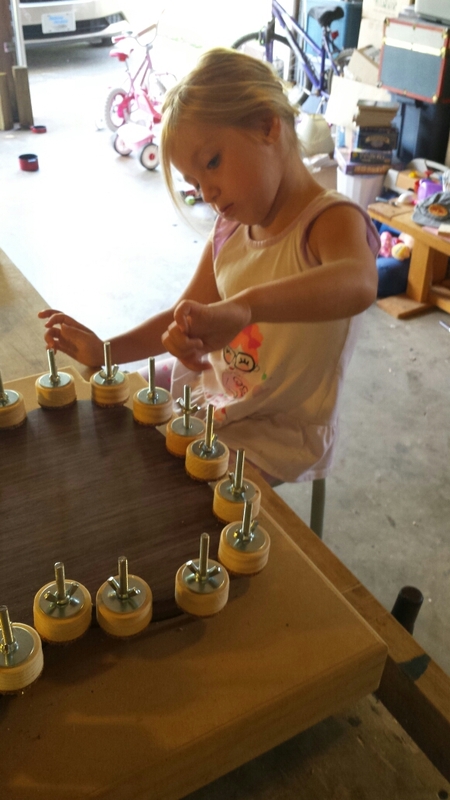 After bracing the soundboard and back plate of the guitar the next major step is assembling the sound box. My daughter memorized the book in a few readings and went around the house performing in character, so every time I went to work on the guitar those words were in my ears. I’ve developed a few skills in my time. 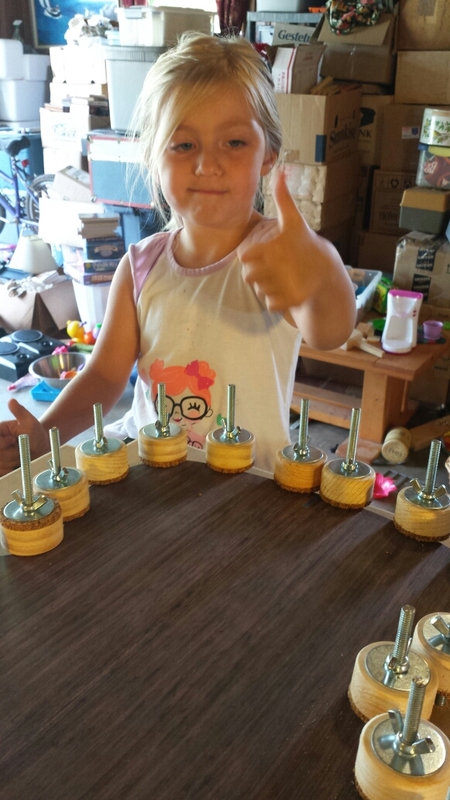 But building an acoustic instrument is something I have no practice at. So, if you don’t have skills or practice, the one thing you have left is preparation. Lots of preparation. I started to think through how this was to be done. Again, most casework is with four sides. Adjustments can be made in multiple places to bring everything into square. But in this case, (at least as I have built it so far) the guitar has three. The top, the back and the joined sides. My hope was to get the sides as “square” as possible so that when it came time to attach the top and back, things would just slip into place. With a tweak here and there (making sure the sides were symmetrical) that is essentially how it worked. 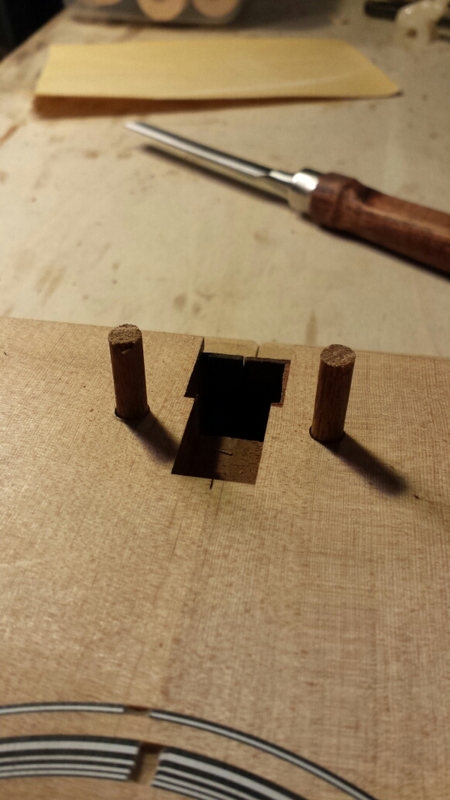 I had to go back in and trim back the brace ends once or twice, and deepen the notches in the kerfing for the braces to make sure they were deep enough to accept the braces and let the plates join securely to the sides. I also went back through with a chisel and leveled up all of the kerfing to the sides. 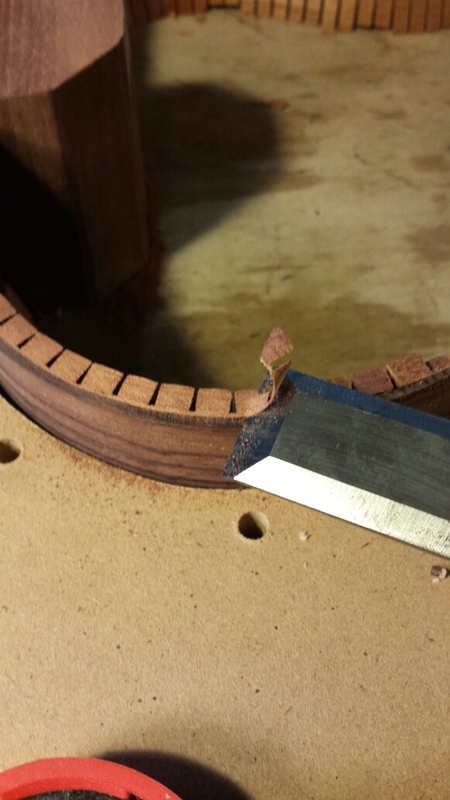 And trimmed the neck and tail blocks with a block plane to accept the front and back. My goal was to start to bring everything into alignment, which is not the same as square in this instance. The top and back of a flat-top guitar are not, in fact, flat. This is a finer point that I forgot to mention in the bracing process. In order to withstand the forces placed upon the body, the front and back of a guitar like this are actually slightly convex. 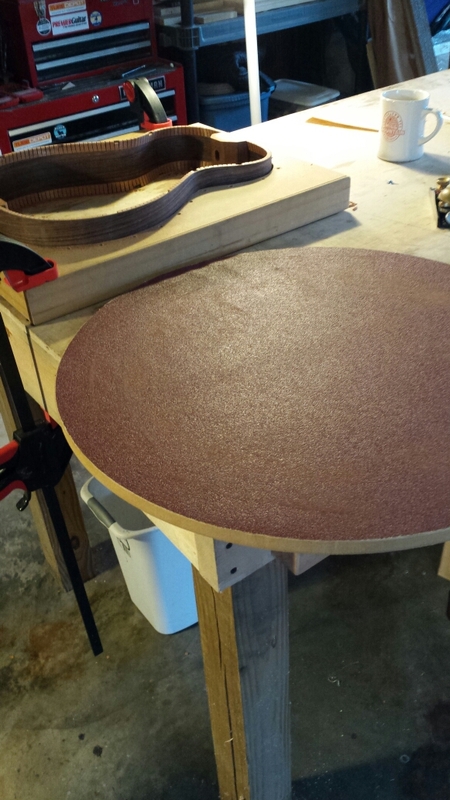 To achieve this effect the braces need to be slightly radiused, and by the method I chose, the soundboard itself is held in radius while they are being glued down. 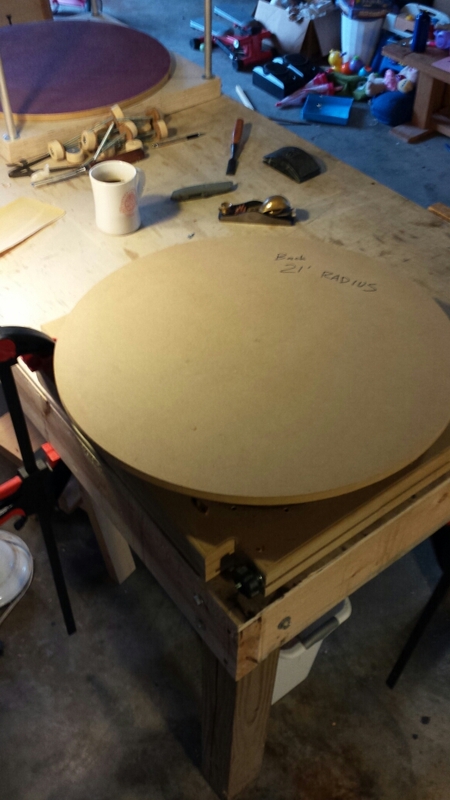 I used radius dishes in the process of shaping and gluing up the braces. The top has a radius of 40′ and the back 21′. 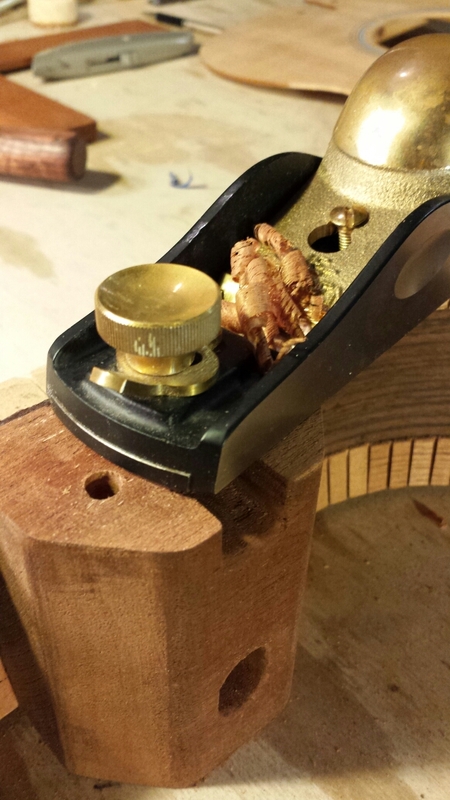 I’m going to detail the making of the radius dishes in another post about jigs and cauls, but they’ve got plenty of uses in the process. Not only did they help shape the braces, but after I finished with the bracing I broke out the contact cement and affixed large sheets of sandpaper to the dishes so that I could use them to level and bevel the kerfing and blocks in the guitar body to match the radii of the front and back. To do this I clamped the body form down to my work table, centered the dish on the body and then turned the dish (letting the weight of the dish apply all the pressure you need) like a giant steering wheel. Five times in one direction, five in the other, and then I stopped to check all the surfaces for sanding marks, stopping when I saw that everything had been sanded. Flip and repeat with the appropriate dish. At this point there was a lot of testing and adjusting and testing again. 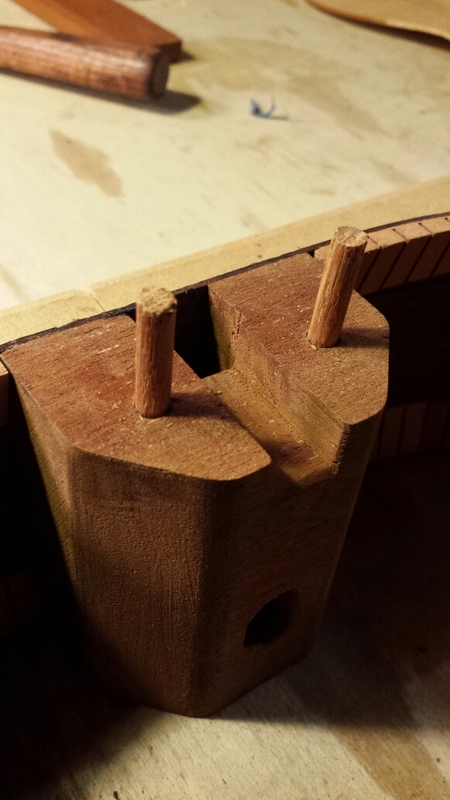 Once I was happy with how the front fit I drilled two holes on either side of the neck block (matching two holes in the soundboard) that I could use to register the top during gluing. These mahogany dowels lined everything up so that I could focus on getting all of the other braces and notches to come together. 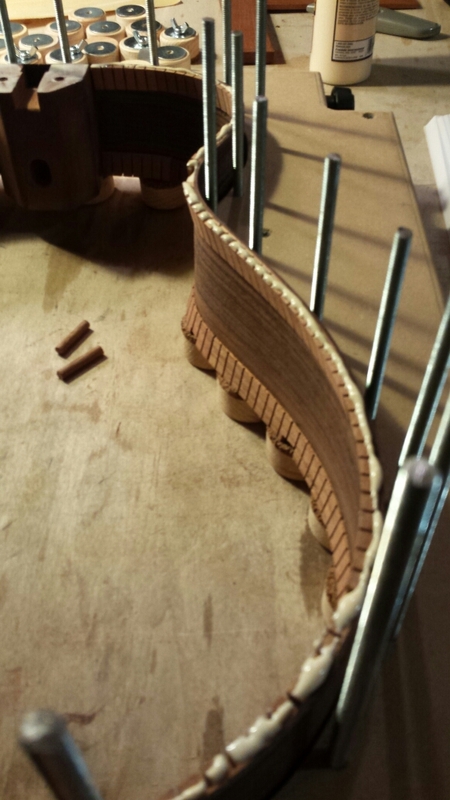 You won’t see the holes as they will be under the fretboard when complete. When I was sure everything worked (by testing it multiple times) I Loaded the form up with spool clamp bottoms and broke out the glue. 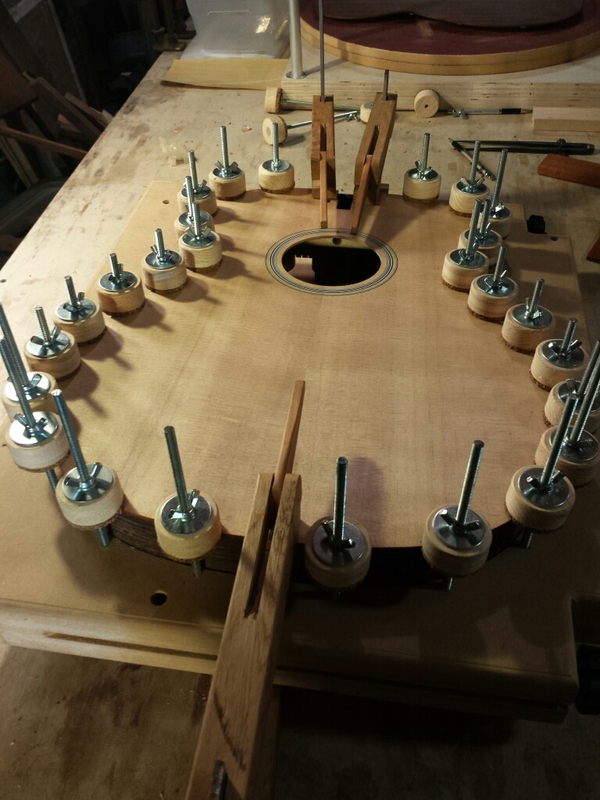 After applying glue to the neck and tail block I ran a bead arount the kerfing, located the soundboard and went around the body clockwise adding clamps until the whole body was secure. I used cam clamps on the neck and tail blocks for extra stability. I finished this bit late at night and let it sit until the next day. The back was very much the same process except this time I had help. My 3 year old and my wife jumped in and helped put on the clamps. Brighton managed the wingnuts with a sense of order and duty that was well beyond her years, and Emily, my wife, brought order to my craziness (as usual). When that mad dash was done, we all took a collective sigh of relief, sat back, and enjoyed a couple of Cokes. Was it the apprentice put the button on upside down, or was that you? I’m sure the cushion effect of the cork would work anyway. Ha! Good eye. That was actually me. It worked out just fine in the end though, thank goodness. Oh no! I hope there was at least a little hyperbole in that statement! You’ve got to keep all those fingers to hold that new little one of yours. Yikes, I’m sorry. It’s a good reminder though that the most dangerous tool in your shop is whichever one you’re using at the time. Hope you’re ok Brian! Sounds like a nasty injury. Wishing you a speedy recovery.